At EAO Adventures we pride ourselves in the service we give. Our founder, Kapanya Kitaba, has worked as head guide for many well respected high quality outfitters and he knows what is required to provide a quality experience. We strive to provide such services at the lowest possible cost to you. On a climb with EAOA you'll have roomy three person tents for two people, fresh ingredients and freshly prepared (not pre-packaged) meals, comfortable chairs with back rests to relax and enjoy your meals and a portable toilet instead of a hole in the ground. You will be taken care of like a family member and we will always see to it that you intake enough food and liquids to help get you to the summit and back. Be forewarned that if Kapanya catches you not consuming properly, "What's not happening here? ", one of his favorite expressions, will ring in your ears often. Mount Kilimanjaro, a giant massif of three extinct volcanoes rising to a height of 19,340 feet (5895 meters) above sea level, can be climbed by several routes. The climb, when undertaken by any of the routes we offer is non-technical in nature. No technical equipment or experience is necessary, and it is more accurately regarded as a strenuous trek. Trekking to the summit is still considered a climb in most climbing circles because of the extreme altitude involved. 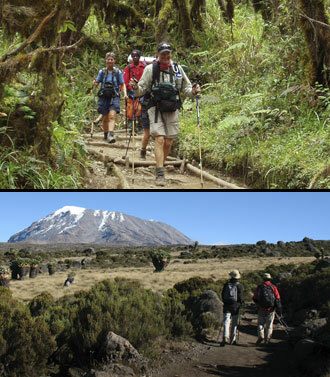 Four climate zones, from Forest to Alpine are crossed in route to the summit Almost any healthy person in good physical condition can reach the summit of Mount Kilimanjaro. But do not be lulled to complacency by this statement. It is a strenuous adventure and you must prepared to train for it. 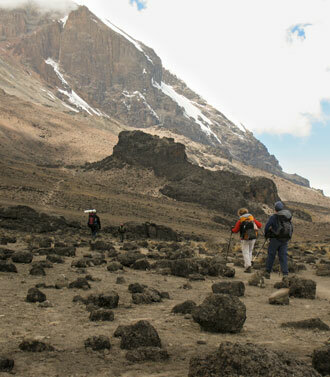 Each of the routes used to climb Kili differs in length, personality, scenery and relative degree of difficulty. At EAO Adventures, we offer you the choice of any of the above routes. The route we highly recommend is the Shira or "Forest" route, also known as the Western Breach route. The reason for this is that it is a slightly longer, overall less steep approach. Aside from the push to Crater Camp on the day before summit day, this route allows for a slower ascent and more time to acclimatize to the increasing altitude. In addition, because you spend the night before your summit push (and the subsequent 7,000 ft. descent to the final night's camp) in the outer volcanic crater at 18,500 ft. asl, the push to the summit is only an 840 ft., approximately one hour climb. As a result, the Forest/Shira route offers the greatest rate of success. It is also very beautiful. This is the route we include in our standard Climb And Safari package. 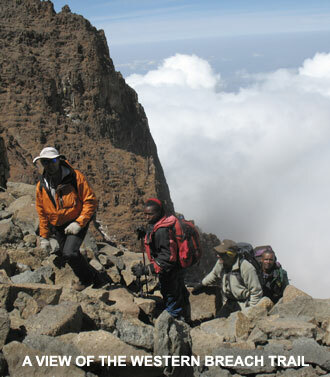 Mount Meru rises from the Great Rift Valley floor to an altitude of 16,000' above sea level. This cllimb/trek can be done either on it's own, as a conditioning hike in preparation for Mount Kilimanjaro or in conjunction with any Climb and Safari package. and Crater Camp, along the Western Breach route. Lava Tower is in the lower center background.